Those believing a woman cannot tell a male dominated story set in a very real situation will have to eat their words after seeing The Hurt Locker. Kathryn Bigelow's Oscar win may be seen by some as a political prerequisite, both in the fact that a female director has never earned that honour, and of course the movie's topical subject matter. With movies being such a subjective experience for a viewer (depending on the individual taste of the audience members, their mood when watching the movie, and in this case your stance on war and religious affiliation), not everyone will take away the same feelings from this one. As Vietnam weighed heavily on the American conscience (eventually opening the floodgates for movies dealing with the theme), the current situation in the post-Hussein Iraq is hardly one of stability, and the amount of movies dealing with the subject has been few & far between. When it comes to the building of tension ina motion picture, there are few situations more effective than the suspense milked from a bomb disposal scene. 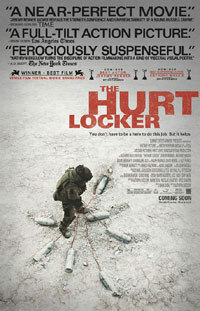 The Hurt Locker however makes this concentrated subject very real, tense, human, and above all effective without cheap tricks. The focus of a US bomb disposal trio in the middle of Iraq captures the danger, stress, conflict, madness and emotions drawn from a life threatening job such as that, and keeps the audience right there from the start. One of the few jarring elements however (more from a technical aspect) that distracted me was the sometimes pretentious hand held effect. A nice addition comes in the shape of big name actors in secondary supporting roles like Fiennes, Pearce and Morse, with lesser known actors in the leads (however Oscar nominated Jeremy Renner made an impressive turn in 28 Weeks Later, also in a military role). Some of the impacting tracks on the sparse, downplayed Marco Beltrami & Buck Sanders soundtrack is the apt inclusion of songs from Al Jourgensen's Ministry album Rio Grande Blood, which digs deeply into the George W. Bush / Iraq situation. War is not pretty, from whichever perspective, whether justified or not - and The Hurt Locker makes for an admirable addition to the ranks of American themed conflict movies like Apocalypse Now, Platoon, Full Metal Jacket and Saving Private Ryan. PS. It is ironic how Bigelow beat her ex James Cameron's record breaking Avatar in all the top Oscar spots (incl. Best Picture, -Director, -Screenplay, -Editing, -Sound, and -Sound Editing - plus a list more including BAFTAs, film festival and film society award wins, Golden Globe and other nominations).